The Melissa Huntsman collection began with a simple vision: Create classic, affordable designs that are on par with current trends and fashion. She uses only real semi-precious stones, freshwater pearls and Swarovski crystals in her work. 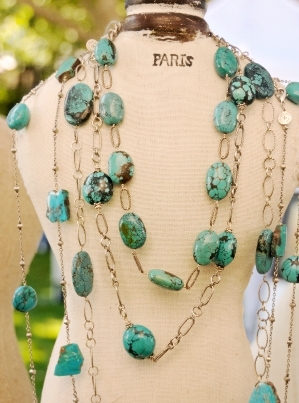 Owner and Designer Melissa Huntsman established her line after receiving several requests from friends and co-workers who were enamored by her jewelry, accessories and unique sense of style. They were surprised to find that Melissa had personally designed each piece and they soon began placing orders for the latest items to hit the Melissa Huntsman Collection. A self-taught jewelry maker, Melissa takes special pride in designing elegant creations that are both whimsical and fashion forward. In her studio she individually strings, knots, wires and assembles each piece of jewelry. Her clients appreciate knowing that each piece they own is a creation of the designer herself. “I hope you enjoy all of the wonderful jewelry that I craft. Each piece is made with absolute care, attention to detail and the best quality pearls and stones available.” –Melissa.